"We love our bench as much as when you made it for us and it looks just the same. Chrissy loves it, too." 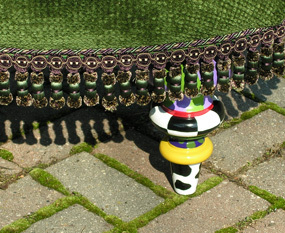 "The cushion attached nicely to the legs without much space between. 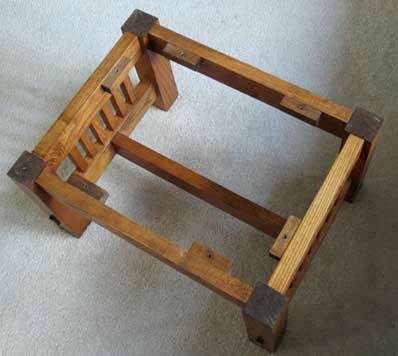 We just love our stool and it gets lots of compliments"
"Looks good in the living room, by the front door, but it's currently on the porch in a spot I can see from my kitchen sink. 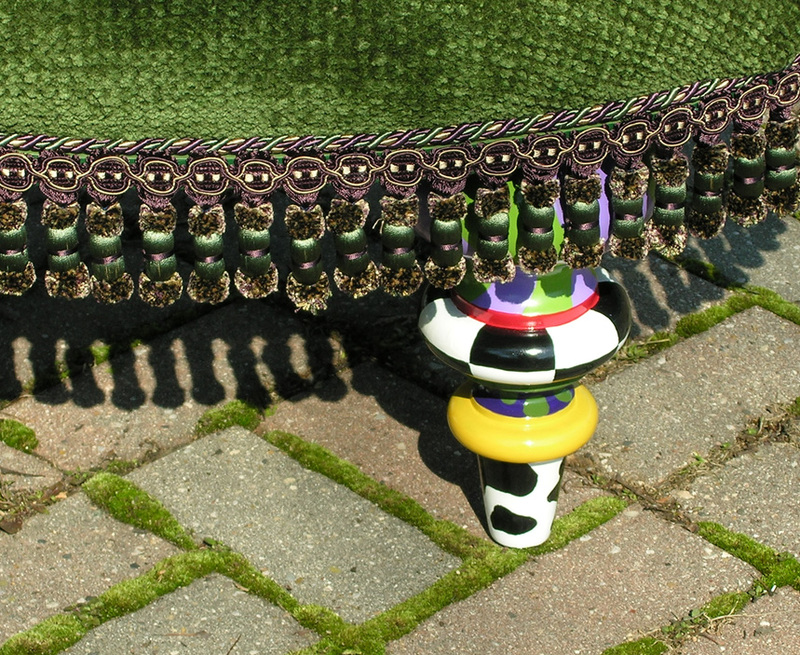 It's a very 'happy' stool -- cheerful to look at." "I just love them. 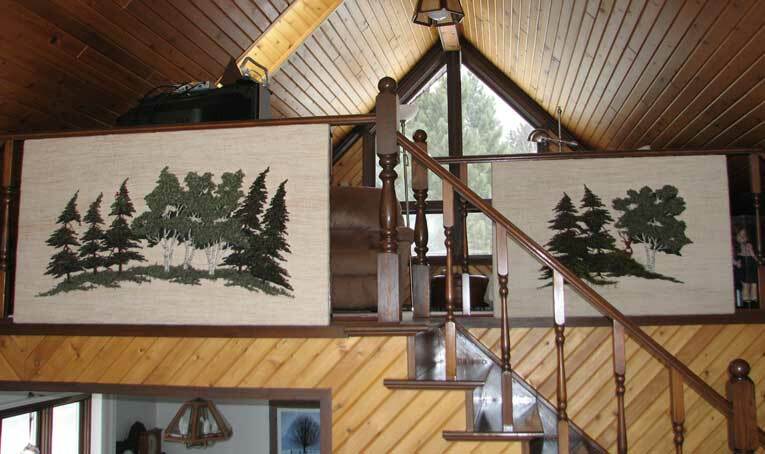 They are more that I ever thought that I could find for a hanging for the railing, and I had looked for a couple of years. They are just perfect. They bring the outside into our Living Room, (and they don't lose their leaves so we have summer year around). The work is just excellent." "Wow! 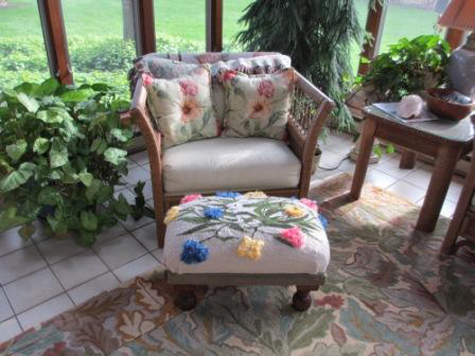 Many times we are stopped by the beauty of the weaving when we walk into the living room. I am still amazed at the realism of the image you have been able to capture. Your research and creativity in design is astounding! We were very impressed with the outcome of the design process. Your art of creatively bringing in different colors and textures to make a picture jump off of the pallet is inspiring! The outcome is awesome! Every day we appreciate your attention to detail. The small enjoyments that were put in for us to find again and again. Thank you for your execution of this wonderful piece of art for our home." 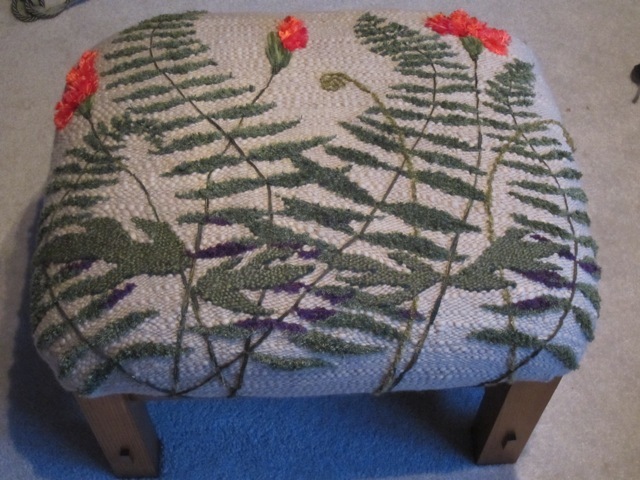 "My husband and I had been looking for a large ottoman for some time. When we happened upon Lisa and Cris Berry's booth at an (art) fair we were so impressed with the beautiful designs and craftsmanship. 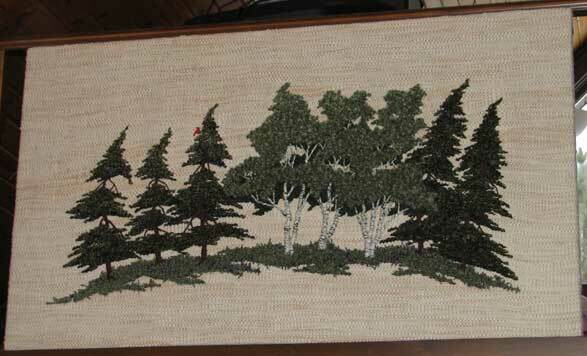 There was nothing as large as what we wanted, but Lisa offered to make something to our specifications. When I mentioned that I love flowers and gardening, she suggested I email some of my garden photos. The design and color palette she came up with based on my photos was amazing. 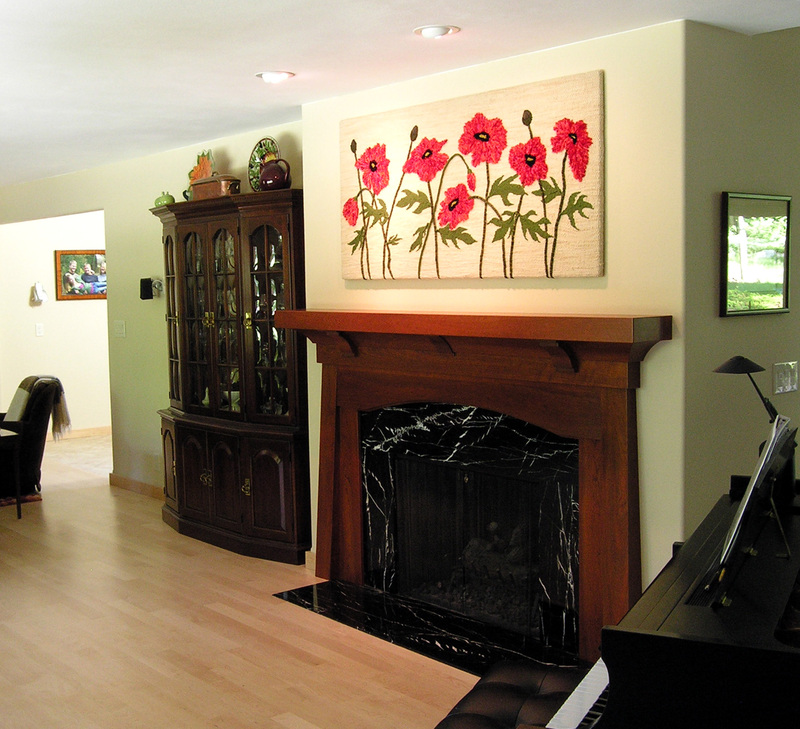 We were totally pleased with the finished piece and enjoy using it every day." 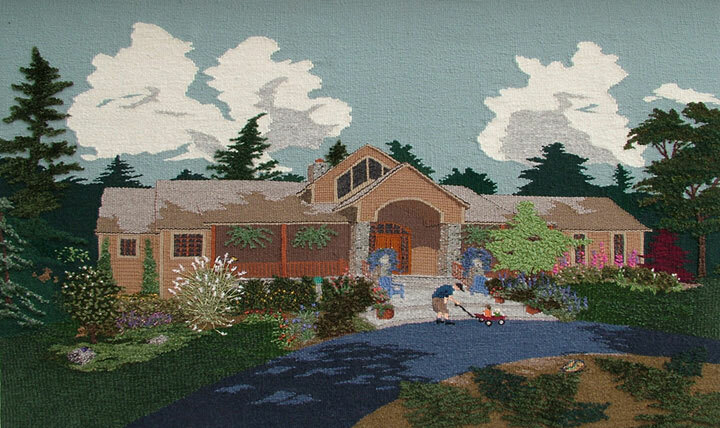 In the Fall of 2004, husband and wife team, Lisa and Cris Berry of Motherloom Studios had the incredible opportunity of offering their artistic talents to the family of world-renown golfer Arnold Palmer. Arnold Palmer’s daughter admired Motherloom Studios’ tapestry work at Wickwire Gallery located in Hendersonville, NC and placed a commission inquiry for a handwoven tapestry foot stool for her father’s upcoming 75th birthday. "I was delighted to make this client-artist connection," says Shirley Palmer-Hill, owner of Wickwire Gallery. "The artist and I share a common desire to please the customer and make them an integral part of the creative team." Motherloom Studios enthusiastically accepted the commission. 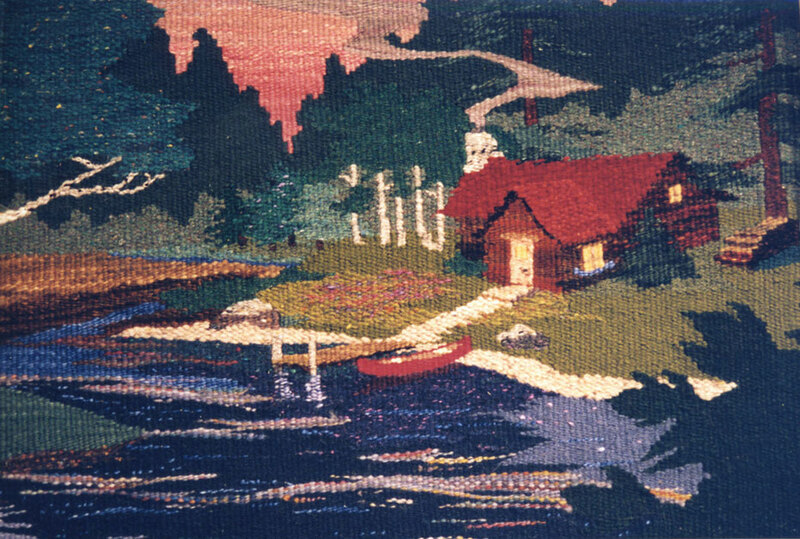 After extensive research and details from Palmer’s daughter, a tapestry impression of the 18th hole at Latrobe Country Club in Latrobe, Pennsylvania became the perfect subject matter for his footstool. "Latrobe holds special significance for Mr. Palmer and his family," explains Berry. 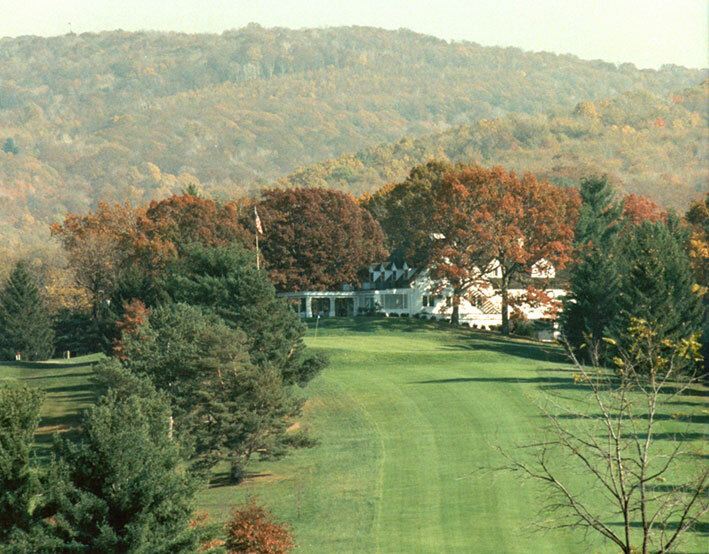 "Latrobe is his birthplace and he has been the sole owner of the country club since 1971." 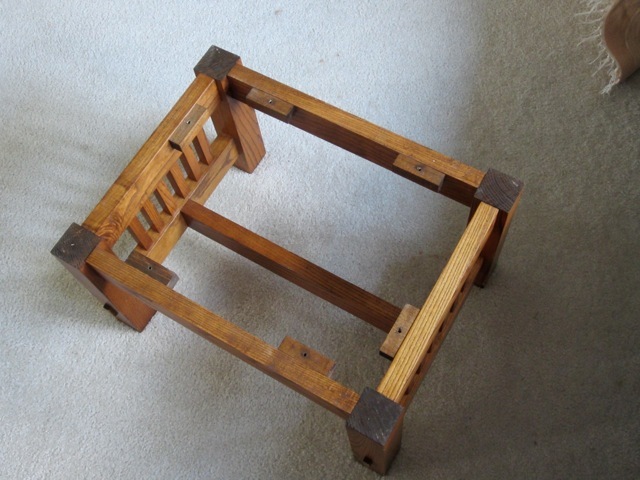 The completed footstool, measuring 20”x16”x15”, included a handcrafted wooden base embellished with a personalized message from the Palmer family. The footstool was adored by all of the Palmers, including Arnold’s fiancé, Kit Gawthrop. 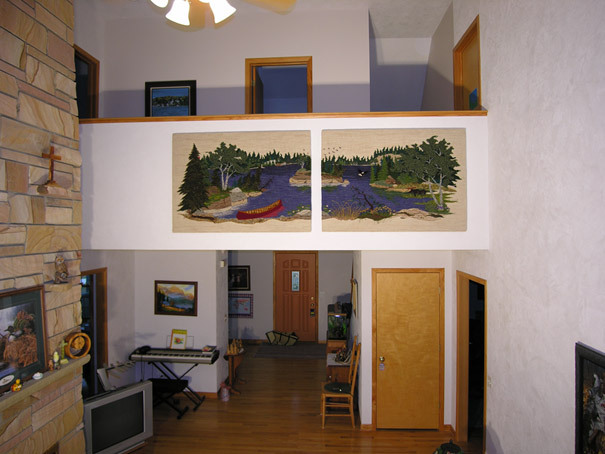 Gawthrop was so impressed by Motherloom Studios’ extraordinary work she commissioned Lisa and Cris to create a tapestry wall hanging for her children. 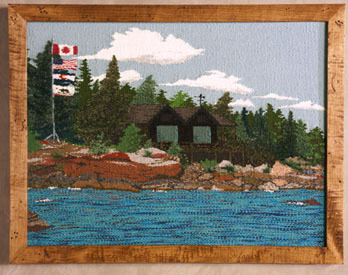 Palmer’s fiancé requested the subject of the wall hanging to be “Gawthrop Camp”, a family owned cabin, located on an island in Desbarats, Ontario, that was razed earlier this year. 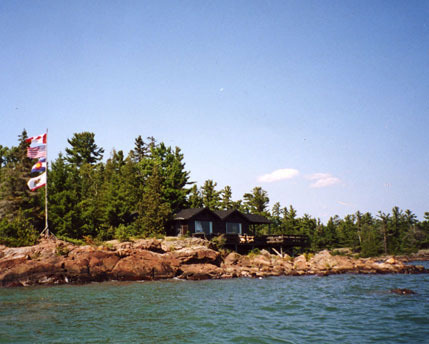 Gawthrop wanted to preserve memories of the cabin and its surroundings for her children. The 36”x28” tapestry wall hanging was completed in December 2004 and proudly resides in the Gawthrop private collection. Wickwire Gallery (phone: 828-692-6222) is located in historic downtown Hendersonville, NC, and carries exclusive one-of-a-kind works by accomplished American artists. 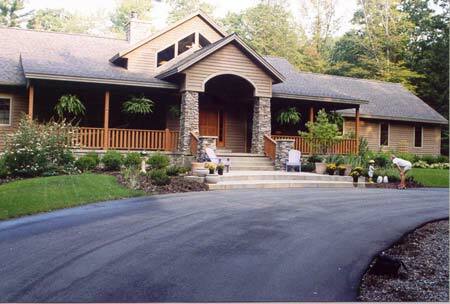 Established in 1998, the gallery also has a companion web site at www.wickwireartgallery.com. A high quality digital image of the Arnold Palmer footstool or the “Gawthrop Camp” tapestry wall hanging can be obtained by contacting Lisa McClow Berry lisa@motherloom.com. 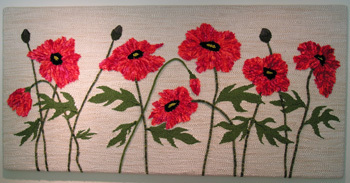 The full line of Motherloom Studio designs can be viewed at www.motherloom.com. 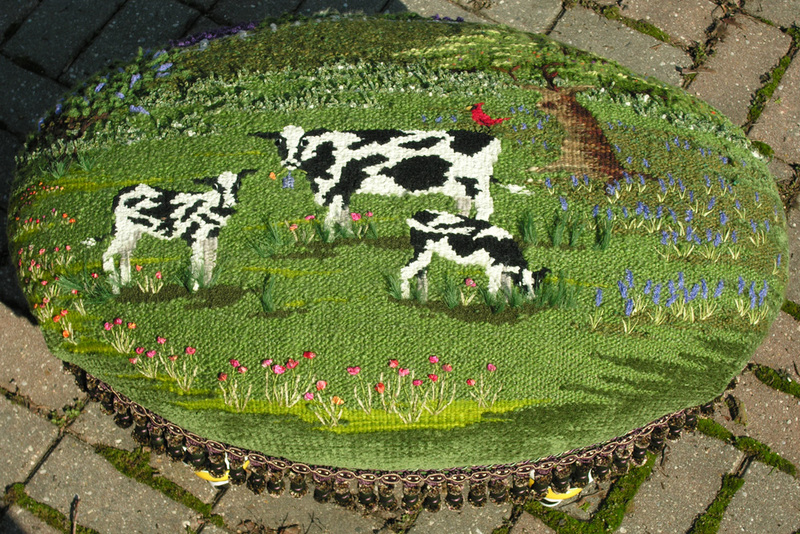 Motherloom Studios creates functional artwork to bring beauty into an environment that appreciates tapestry weaving with a literal and spiritual message. 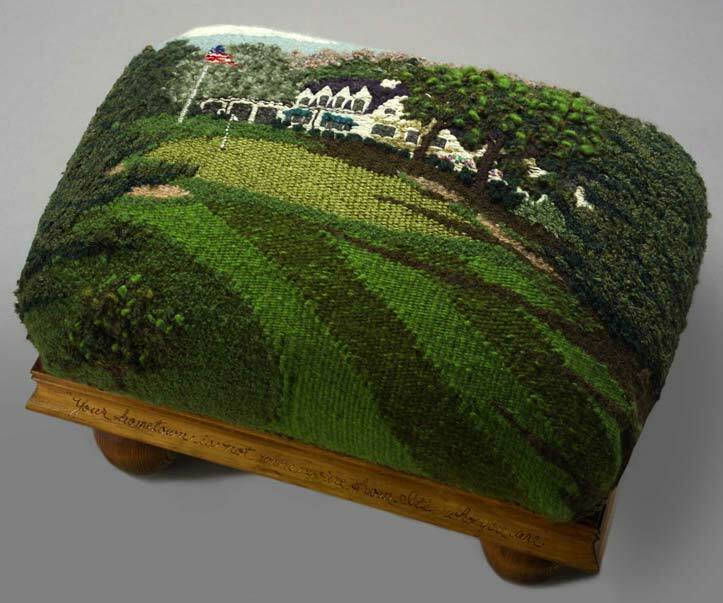 On his 75th birthday (September 10th 2004), Arnold Palmer's daughter presented him with a customized handwoven tapestry footstool created by Motherloom Studios. After spotting Motherloom's artwork at Wickwire Gallery (Hendersonville, NC), Palmer's daughter inquired if Motherloom might be commissioned to create a special piece for the upcoming birthday. "I was delighted to make this client-artist connection," says Shirley Palmer-Hill, owner of Wickwire Gallery. "The artist and I share a common desire to please the customer and make them an integral part of the creative team." Reflecting on the special order, artist Lisa McClow Berry notes, "While I was thrilled by the assignment, I was also a little apprehensive. I wondered how I would ever come up with just the right design for someone as dynamic as Arnold Palmer!" After extensive research and guidance from Palmer’s daughter, an impression of the 18th hole at Latrobe Country Club (Latrobe, PA) seemed the perfect subject matter for his footstool. "Latrobe holds special significance for Mr. Palmer and his family," explains Berry. 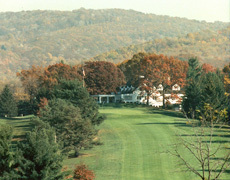 "Latrobe is his birthplace and he has been the sole owner of the country club since 1971." 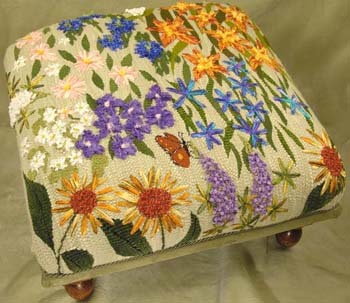 When complete, the fully functional Motherloom footstool included a handcrafted wooden base embellished with a personalized message from the Palmer family. Motherloom Studios is located in Grand Rapids, MI., and run by husband and wife team, Lisa and Cris Berry. In addition to custom commission work, Motherloom weaves a more affordably priced line of richly textured footstools, benches, pillows and wallhangings. Motherloom strives to bring beautiful objects with meaning into the homes of people who appreciate tapestry weaving and its ability to convey both a literal and spiritual message. 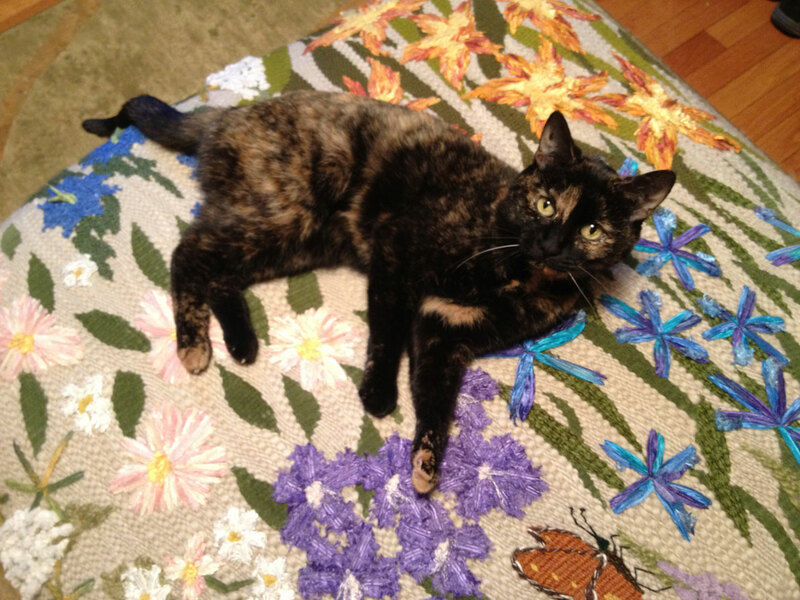 For more information on having Motherloom create a custom piece for you, email Lisa at lisa@motherloom.com. Weaving “Foxchase Circle” was truly a labor of love for me. 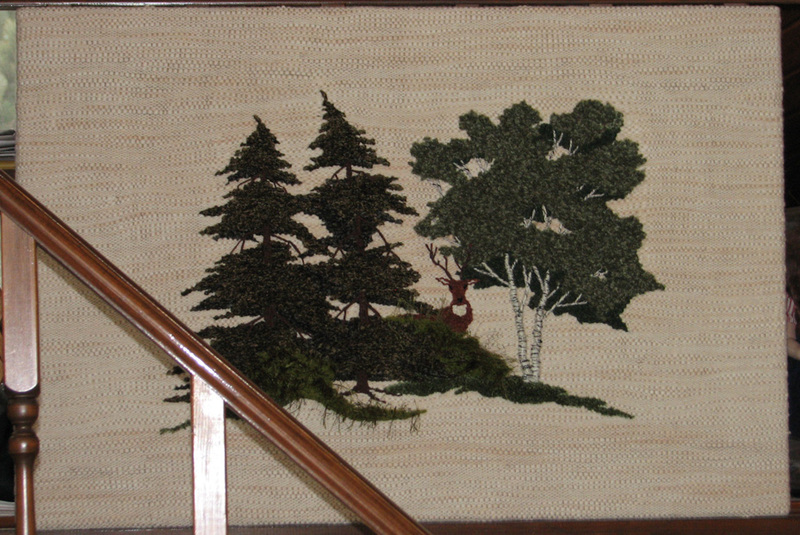 My relationship to both the client and the tapestry subject is very unique. The homeowner is the daughter of my oldest friend and my husband Cris designed the home. We began the commission process by taking many photographs of the structure, the children, and the landscape. 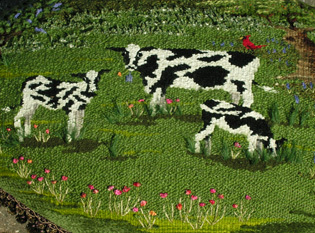 In the tapestry, the gardens are a fantasy projection into the future. 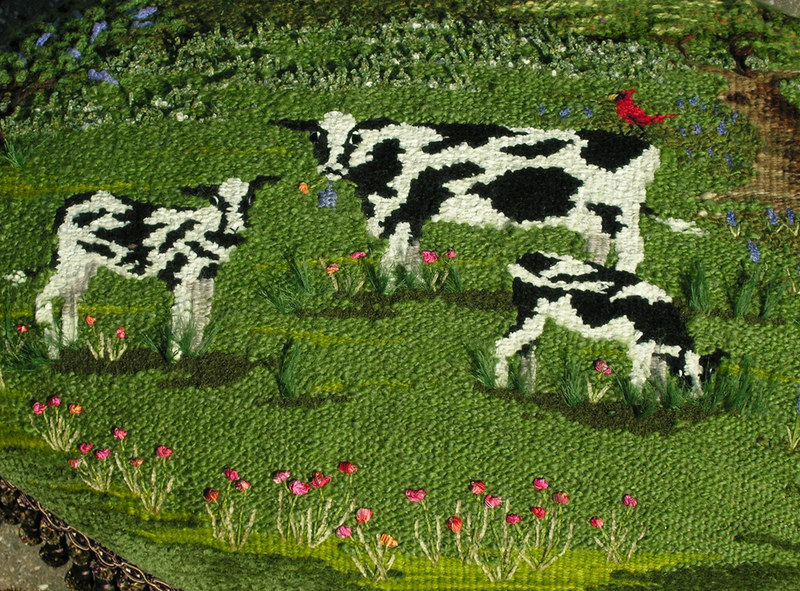 It is a vision that may never be realized thanks to the appetites of a doe and her two fawns, and a rabbit (all appear on the far left side); creatures who also make their home at Foxchase Circle. The tiny goldfinch landed on the tip of the buddleia just as my friend and I were taking pictures of her gardens. A butterfly rests atop a fern leaf in the foreground, representing one of the wonderful stories my friend shares with her children. The consultations and design process, the search for just the right yarn colors and textures to express each flower and shingle, and finally weaving the tapestry, took over four months to complete. It is one of the most personally satisfying pieces I’ve ever had the opportunity to create. I am grateful for the experience. of commission work from the last 40 plus years.